Below is the third installment in our series, AIML: Big Changes, Big Conversations. Taking AIML (Artificial Intelligence and Machine Learning) as our example, we will explore methods for accelerating and amplifying conversations around major changes in ways that enable us, as individuals and as a collective, to understand and direct their impact. Collective Next recently had the pleasure of working with Michell Zappa at Innotribe at Sibos 2016 in Geneva. Michell is a technology thinker, information designer, self-proclaimed futurist, and founder of Envisioning, a virtual research institute. During his presentation in Geneva, he shared a Paul Graham quote, “When experts are wrong, it’s often because they’re experts on an earlier version of the world.” Far from being an expert on an outdated era, Michell has dedicated himself to finding ways to envision our technology rich future. I had an opportunity to speak with him in-depth just after his return from Switzerland. Marsha Dunn: What does a non-technical person need to know about the difference between AI (artificial intelligence) and IA (intelligence augmentation) – and why is it important? Marsha: Delving into IA, can you talk about the concept of the “centaur.” What advantage does this approach offer? Michell: We are all familiar with IBM supercomputer Deep Blue’s 1997 victory over then World Chess Champion Garry Kasparov. What has drawn less notice is how this event spurred the creation of “centaur”(link is external) players. Centaurs represent the combination of the best available human and machine characteristics(link is external). Human strengths such as creativity, adaptability, and intuition are combined with the computer’s superior ability to be consistent, objective, and precise. The computer processes massive amounts of data from which the human makes a decision. The result: For over a decade, centaur players have outperformed both grandmasters and machines operating independently. Nothing else stands a chance. Marsha: What advantages can organizations gain from embracing the notion of centaurs? Michell: Think about a company like Netflix. They developed the hit series, House of Cards, by harnessing a centaur-inspired approach. Using the strength of machines, Netflix capitalized on their massive data around user preferences, generated algorithms, and then combined this with top-notch human writing, acting, and directing. Shifting from a binary view of machines and humans to one that looks for synergies between the two can be very powerful for organizations. Marsha: You are committed to finding ways to help people envision the future, which is something organizational leaders work hard to do. You talk about “technology thinking” as being a critical ingredient in this process. Can you explain? Michell: “Technology thinking” consists of a several interrelated pieces. First, we need to recognize that everything not natural is technology – writing, agriculture, currency, all the way back to the wheel. And by extension, all companies are technology companies. As a result, we need to be looking at technology from an historical perspective and from a perspective that is broader than IT and engineering. Building on this broad understanding of technology, the second piece of tech thinking is about looking for underlying patterns in technological evolution in order to help envision the future. We tend to think of technology as being about artifacts—gadgets and devices—and these are in constant flux. If you use the metaphor of an ocean, you can think of these artifacts as the surface layer, waves that are always in motion. However, on the ocean floor, there are fundamental patterns that remain constant over time, and we need to recognize these. Marsha: You have begun codifying these constants by identifying “technology principles.” One of these principles is the notion of combinatorial evolution. Michell: Combinatorial evolution relies on the premise that all new technology is the result of combining existing technologies. Google was among the first to realize this. The combination of navigation from Google Maps and machine vision from Google Images forms the basis of the technology of the self-driving car. If you break down almost any technology you can identify the technologies that enabled it. And it doesn’t matter where you drill for oil so to speak. Think about three technologies that enabled the smart phone: the touch screen, data signal, and geolocation. To have geolocation you needed the atomic clock, triangulation, the satellite, and the rocket. A logic that says you needed the rocket to invent the smart phone is not obvious. What is more, sometimes the enabling technology is something invisible like mass manufacturing. Marsha: To be successful in the future, do companies need to be looking at technology in combinatorial ways? Michell: We have been looking at the principle of combinatorial evolution in hindsight but it can be used in a predictive manner as well. This principle suggests a powerful prototyping approach. For example, organizations can begin taking technologies available in-house and combining them with things on the market. They can ask questions like, “What does big data plus data visualization look like in terms of customer service? Such an exercise leads to envisioning new possibilities for the future. Marsha: Another important principle you have identified is “technological unintended consequences.” What is this about? Michell: While counterintuitive, unintended consequences is another constant in technological evolution. This principle refers to the fact that it is really difficult to understand the second, third, and fourth order effects of technology. The classic example is that Henry Ford didn’t foresee the traffic jam. Similarly, with the invention of the elevator nobody anticipated that the long-term effects would include urbanization. Prior to the elevator vertical construction had been limited by how many flights of stairs one could reasonably climb. Elevators led to high-rises, which led to the rewiring of the planet. There is a famous quote(link is external): “We tend to overestimate the effect of a technology in the short run and underestimate the effect in the long run.” It takes a while for a new technology to fully effect society, and it is hard to anticipate what that impact will be. Unintended consequences are a constant even though you can’t predict how they will play out. Marsha: As a self-proclaimed futurist, you are always swimming in a world of hypotheticals, yet through tools such as your technology cards and infographics you find ways to make the future more tangible. Can you talk about some of these tools and how organizations might use them? 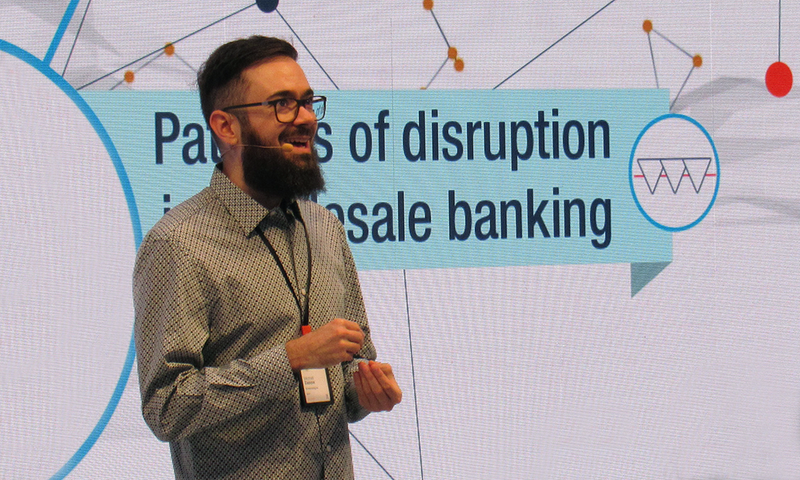 Michell: At Innotribe at Sibos’ this year, I facilitated an exercise(link is external) for executives in the banking, financial services, and FinTech industry using technology cards(link is external) to underscore the principle of combinatorial evolution. Each card features an image and description of an existing technology. Participants work in small groups combining these cards (technologies) to solve a given business challenge such as customer service. The diversity and relevance of the ideas that emerge is striking. Through this exercise the concept of combinatorial evolutions becomes more concrete, something clicks for the participants. The infographics(link is external) were something I began developing in 2011. At almost 200 slides, my keynote presentation had become entirely unwieldy. I felt there must be a better way. A highly visual, single-frame, infographic format allows me to show a great deal of data as well as interrelationships, sequencing, synergies, etc. with a lot less real estate and a lot more impact. Michell: As I discussed earlier with technology thinking, all companies, and by extension all disciplines, are involved in technology. In order to build an appropriate body of knowledge we need to share information with one another, and we need to build upon each other’s insights. This conviction is at the heart of my work. Marsha: Before you leave us, what is the one question that organizations and organizational leaders should be asking about the future of technology that you aren’t hearing? Michell: “What are the underlying patterns of technological evolution?” Technology is more predictable and manageable than it seems. But you need to shift your attention from the noise at the surface to the underlying patterns, the constants. Here lies the challenge and the reward for todays leader’s.